– Floor controlled Guitar Processing System with fully programmable THETA preamp and Vintage Preamp. – 32 bit floating point processing with state of the art A/D and D/A converters providing 124db dynamic range between input and output and over 1500db internal dynamic range. – Proprietary hyper-oversampled distortion algorithm provides higher gain than any other digital preamp with zero aliasing or digital artifacts. – TRUE SPEAKER offers ISP’s convolved Speaker Samples for true “direct to mixer” live or recording realism. 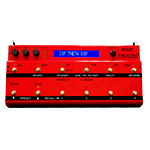 – Patented Digital Decimator® for the absolute best real-time guitar noise reduction. – Pre-distort and post Distort tone shaping with multiple band full parametric equalization. – Studio quality effects processing with wha, compressor, multistage phaser, stereo flanger, four voice chorus, 1300ms delay and studio reverb. – 224 user programmable presets for sound library storage. – Song mode with 124 user programmable songs with 4 presets per song.